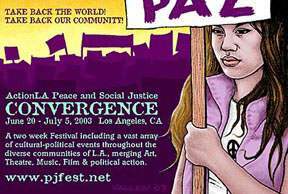 ActionLA Peace and Social Justice Convergence June 20 - July 5 2003 Los Angeles Web: www.PJFest.net Tel: (213)413-1778 PJ Fest is the project of ActionLA Web: www.ActionLA.org "Take Back the World! Take Back Our Community!" With the war in Iraq now become the occupations of Iraq, and the Bush regime's continue declare the war against the World. Our struggle will be never finished. 2) No US Occupations of Iraq and Afghanistan. 4) Bring the war money back to the community, we demand: books not bombs, foods not guns, jobs not wars. Our coalition in Los Angeles has decided to call for a major 2-weeks long Peace and Social Justice Convergence in Los Angeles to focus on how to link global struggles to the community issues, and demand "Take Back the World, Take Back Our Community!" This two-week Festival will include a vast array of cultural-political events throughout the diverse communities of Southern California and will merge art, dance, theater, music, film/video, and photography, with political analysis and action. It will involve and reflect the rainbow of ethnic and racial diversity in our community. Some events will be big, like Sol festival on June 21 (independent from the convergence but we work together), will attract 10,000-15,000 people in LA's MacArthur Park, the possible major speaker's night will be attract around 1000 people, and film festival, so far, major participate organizations and endorsers include: Sol foundation, Coalition of World Peace, LA CISPES, SEIU local 434B, Pacifica Radio-KPFK Los Angeles, Neighborhood for Peace and Justice, Global Exchange and more. 6/20 (Fri) 8:00 PM - 11:00 PM, Arts in Action: Opening Ceremony for the Peace and Social Justice Convergence in Arts in Actions, music, community dialogue food, confirm performer included “Oligarchy” by The Liberty Cabbage Theatre Revival, a collectively-run political performance troupe based in Western Massachusetts. “Oiligarchy is a tragic comedy about love, loss and addiction”, joked Charlotte Capogna, a member of the troupe, “Our show includes puppetry, poetry and music about petroleum- petroleum history, its alternatives, and its ties to war”. 6/24 (Tue) 8:00 PM - 11:00 PM, Echo Park Film Center, 1200 N. Alvarado St.: Youth Struggle Night and Film Showing, co-sponsor with Youth Student Network of Oct 22 Coalition, featuring 2-hour film “Justifiable Homicide,” and discussion afterward. ·	Micheal Galinsky’s “Horns and Halos” (first 15 mim introduction) which chronicles the efforts of a small press to the GW Bush campaign bio “Fortunate Son” back on bookstore shelves after it was pull by St. Martin Press during 2000 Presidential election. ·	“Gaza Strip” by: James Longley, filmed during the first four months of 2001, a period that covers the election of Israeli prime minister Ariel Sharon and extends to the first major armed incursion into "Area A" by the Israeli military. ·	Several other short film subjects, and anti-war promotional films. And music performance by Ancestry of Sound, a Los Angeles-based group consisting of 9 members, with hip-hop, funk, jazz, and spoken word, they strive to break new musical ground while paying homage to our ancestors. 6/26 (Thu) 7:00 PM - 11:00 PM, Luna Sol Café, 2501 West 6th St.: Peace and Justice Spoken Word/Open Mike Night, co-sponsor with Luna Sol Café/Book Store, we invite artists, performers, poets please come to express yourself! 6/27 (Fri) 7:00 - 11:00 PM, Arts in Action: Political Prisoner Night, co-sponsored with Jericho Amnesty Coalition-LA. A benefit Hip-Hop concert with LIQDZUNSHINE and other bands, speakers, videos and spoken word, in solidarity with the struggle to free political prisoners. Speakers from Asians for Jericho and Mumia, New Panther Vanguard Movement, ARA-Los Angeles and Anarchist Black Cross. 6/29 (Sun) 12:00 PM - 6:00 PM Peace and Justice Book Fair-Venice Beach Peace with Justice Center, 1020 Victoria Ave. at Lincoln Blvd: Free admissions, will includes dozen community based book vendors, activist hand-made crafts, free books, speakers and performance, co-sponsor with ICUJP. 6/29 (Sun) 6:00 PM - 11:00 PM, Arts in Action. Peace Conference - War In Iraq and the "Healthcare Not Warfare" campaign in So. California: Co-sponsor with Coalition for World Peace, a political/cultural event by one of the leading antiwar/peace groups in Los Angeles. A variety of speakers and performers will put a human face on the war, at home, on the battlefield and around the world. Speakers from countries targeted by the U.S. will tell about their people. Confirmed speakers/performers include: Nazar Andray (will talk about Lebanon & Syria), Yvval Ron (middle eastern music), and film "Iraq Voicesfrom the Street). AND MORE! 7/1 (Tue) 8:00 PM - 11:00 PM: Asian People Struggle Night, peace movements across the Asia, from Korea to Philippines, location: TBA, co-sponsor with Asian Pacific American Labor Alliance-Los Angeles. 7/2 (Wed) 8:00 PM - 11:00 PM, Arts in Action "A Celebration in Support of the Constitution" Neighbors for Peace & Justice and FPNN will co-host an evening to Celebrate and Support the Constitution of the USA: Join the festivities to learn more about what is happening to our Civil Right and Civil Liberties and what you can do to take a pro-active role within your community to protect the future of our Constitution. We will have speakers, music, poetry and film for your enjoyment and education. 7/3 (Thu) 8:00 PM - 11:00 PM: Immigrants Struggle Night, co-sponsor with different immigrant groups, a night to discuses the current immigrant bashing, anti-immigrant sentiments in this country, as well as the impacts on PATROTIC ACT I/II.